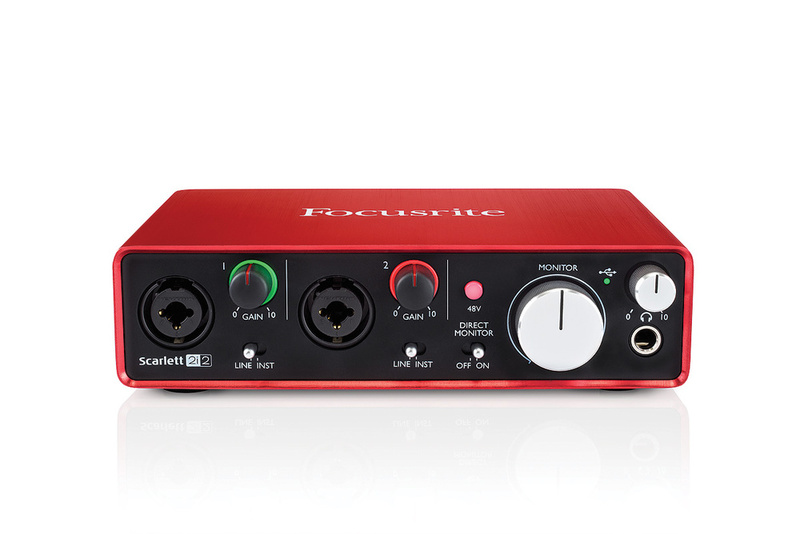 Focusrite have updated and improved their Scarlett interface range. From the desktop 2i2 and Solo units to the rackmountable 18i20, with eight built-in mic preamps and ADAT digital expandability, there are Scarlett interfaces to suit most studios. In fact, Focusrite say that since its launch in 2011, the 2i2 has become the best-selling USB audio interface in the world. Five years is a long time in music technology, however, and Focusrite have now ‘refreshed’ their range of USB interfaces to reflect new developments and changing priorities. Popular though the original Scarletts were, they attracted criticism in some quarters. This was mainly directed at Focusrite’s control software, which some found awkward to use, and at their drivers, which didn’t offer stellar low-latency performance, and lacked clarity as to the actual latency a given setting would yield. So, although the ‘second generation’ Scarletts have had a physical makeover, it’s the software that has seen arguably the biggest changes. For this review, Focusrite sent two of the six Scarletts: the 2i2 and the 1U 18i20. There’s not space here to list the complement of I/O that each Scarlett possesses, but both follow tried and tested formats, and are practically identical to their ‘first generation’ Scarlett predecessors. What is new is the physical design: both units are very classy indeed, losing nothing by comparison with Focusrite’s much more costly Clarett interfaces. At this sort of price, you wouldn’t expect to see features such as colour touchscreens or digital gain controls, but in general, the new Scarletts look and feel a lot more expensive than they are. Focusrite Scarlett 2i2.There are also some changes inside the boxes. The new Scarletts offer slightly better audio specifications than the originals, with dynamic range quoted as 106dB for most of the 2i2’s ins and outs, and 109dB and 108dB respectively for the 18i20’s inputs and outputs — not in the same league as the Claretts, but again, more than adequate at the price. New mic preamp circuitry is said to offer less gain ‘bunching’ at the top of the dial, and the high-impedance inputs have been redesigned to cope with hotter guitar signals. Welcome as all these hardware tweaks are, it’s Focusrite’s software engineers who have delivered the headline improvements in these second-generation Scarletts. However, the fruits of their work vary depending on which Scarlett you have. The smaller, bus-powered models, including the 2i2, have no control panel software of their own, and only on Windows do you need to install a driver. On Mac OS, the Scarletts use Apple’s class-compliant driver, as do many other rival interfaces; but, interestingly, Focusrite offer an optional utility which can reduce its operating latency. With the class-compliant driver, I was able to record at 44.1kHz at a 32-sample buffer size on my early 2014 MacBook Air. Reaper reported the round-trip latency as being 5.6ms, and a re-recorded click was actually a few samples early, suggesting this figure was not optimistic. After installing the separate low-latency utility, everything still seemed to work, the reported round-trip latency dropped to an impressive 3.9ms, and my re-recorded audio lined up almost to the sample with the original. What’s more, two-thirds of that 3.9ms is reported as being on the input side, so response for virtual instruments (which use only the output buffer) should be lightning-fast. I repeated these tests using the larger 18i20, with identical results. On Windows, Focusrite’s new ASIO driver allows you to choose buffer sizes down to a possibly optimistic 16 samples. I was able to use Oblique Audio’s RTL Utility to measure the round-trip latency at this setting; at 44.1kHz it clocked in at 3.8ms, with a 32-sample buffer delivering 4.6ms. It wasn’t possible to run any audio applications at these low latencies on my machine, but said computer is now rather long in the tooth, so hopefully it should be possible to achieve sub-5ms latency on modern PCs. If you’re not able or inclined to run at very low buffer settings, alternative options for low-latency monitoring of audio inputs are available. On the 2i2 and other mini-Scarletts, a switch on the front panel feeds the input signal directly into the outputs, allowing you to audition the input signal with true-zero latency. On the larger Scarletts, you’ll be in the hands of Focusrite’s software team once again. The first-generation Scarletts, and indeed their counterparts in the Saffire range of Firewire interfaces, used to ship with a control-panel utility called Mix Control. This has generally worked reliably with my own Saffire Pro 40, but could not be described as intuitive or elegant. With their Clarett and Red Thunderbolt interfaces, however, Focusrite introduced an entirely new utility called Focusrite Control, and with the second-generation Scarletts, this replaces Mix Control. Focusrite Control was covered in depth in our review of the Clarett 8Pre in SOS October 2015, so I won’t go into detail about it here. Suffice to say that it’s clean, simple and extremely easy to use, and an improvement in almost every respect over Mix Control. The flip side of this simplicity is that you don’t get the reverb, delay, compression or EQ you’d find in the likes of RME’s TotalMix or PreSonus’s UC Surface; I don’t miss them, but your mileage may vary. Focusrite have also binned one or two Mix Control features that were actually very useful, most notably the mono button and separate L-R mutes. Hopefully, these will be reinstated soon, but even now, the move to Focusrite Control brings vastly more gain than pain, especially with the added dimension of control from iOS devices (see box). Over the last 12 months or so, Focusrite have definitely upped their game in the audio-interface department. The Claretts offer near state-of-the-art audio performance and vanishingly low latency over Thunderbolt; and although these new Scarletts can’t quite match them in either department, they come close enough for most purposes. It should be possible to operate with sub-5ms round trip latency on most recent Macs and PCs, and even if that’s pushing your computer too far, Focusrite Control offers an elegant alternative to working entirely within your DAW. What’s really impressive, though, is the price. 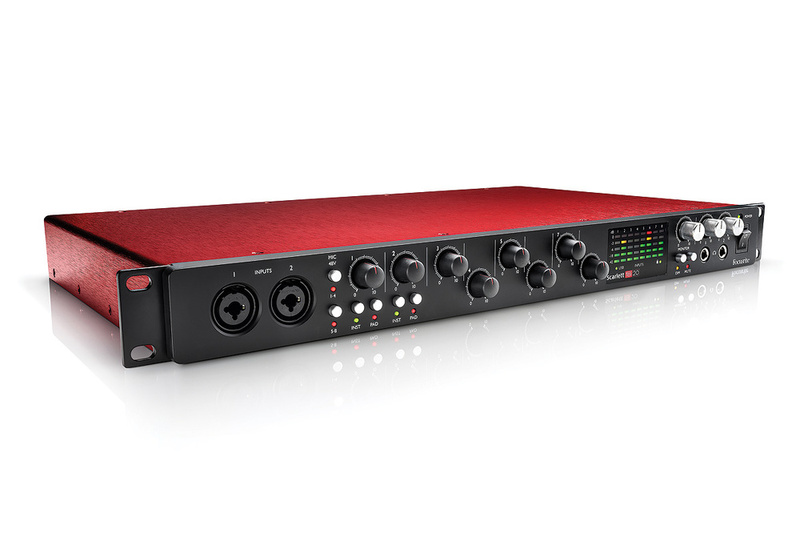 The Scarlett 18i20 offers nearly all of the Clarett 8Pre’s core features, yet it costs some £350$300 less; to improve upon the 18i20’s feature set and specs in an interface with USB connectivity, meanwhile, you’d be looking at the likes of PreSonus’s Studio 192, RME’s Firefaces and MOTU’s 1248, all of them a fair bit more expensive. The new Scarlett range offers very refined products at very competitive prices — what’s not to like? The Focusrite Control software that comes with larger Scarlett, Clarett and Red interfaces has obviously been designed with touchscreen access in mind, and Focusrite have thus made a very logical step in making it available for iOS devices too. In essence, the app gives you control over all digital parameters within the interface. On the Red 4Pre, that means almost everything there is to control, including preamp gain. 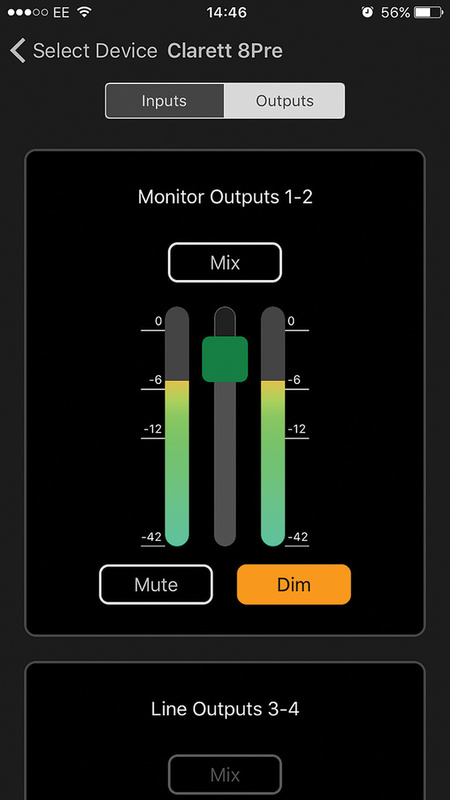 Scarlett owners are not quite as fortunate, but the app still gives you metering and level controls, making it ideal for adjusting cue mixes from the live-room floor. 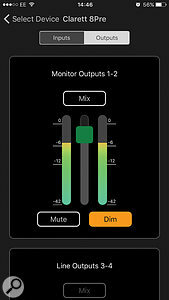 The app is said to work on iPads, iPhones and iPod Touches; no minimum specification is given on the Focusrite web site. I tested it with an iPhone 6 running iOS9, and once the computer and phone were connected to the same Wi-Fi network and the remote device was approved, everything seemed to work as it should do. Capable of operating at very low latency. Focusrite Control utility is intuitive and elegant. Larger Scarletts can now be controlled from iOS devices. One or two features of the old Mix Control utility still missing from Focusrite Control. Focusrite have been listening to their users, and their new Scarletts deliver greatly enhanced low-latency performance among other improvements. Other manufacturers will struggle to deliver USB interfaces of this quality at comparable prices. Scarlett 2i2 £111, Scarlett 18i20 £355. Prices include VAT. Scarlett 2i2 $149.99, Scarlett 18i20 $499.99.